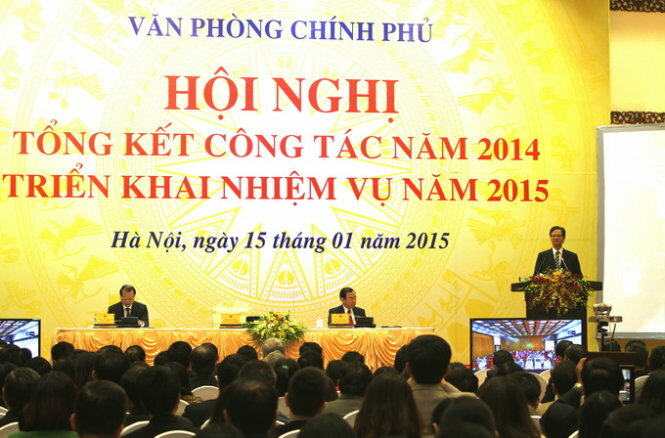 Prime Minister Nguyen Tan Dung is seen standing on the podium to speak at the Government Office's conference held in Hanoi on January 15, 2015. Authorities should provide the public with official and accurate information in a timely manner on social media as it is impossible to ban people from uploading information to social networking sites, Prime Minister Nguyen Tan Dung has said. The Vietnamese primer made the statement at a meeting held on Thursday to review the past performance of the Government Office and discuss tasks for 2015. PM Dung emphasized that the Government Office should make more efforts to better its information and communication activities. “It is unacceptable for us to manage and operate the country’s affairs but fail to keep the public informed of the government’s policies,” the premier said. The government should post its correct and timely information on national policies on social media to make it known to the public and keep them from being influenced by wrong information, he added. “It is impossible for us to ban or prevent people from posting information on the Internet. The most important thing is that we should provide our official, accurate, and timely information on social media, thereby building trust in the people,” the PM said. When incorrect information about certain issues is posted on social media and casts doubt among members of the public, the Government Office should assist the government or other agencies in publishing official information on social networks to help the public correctly understand such issues, he said, noting that ensures the people’s right to get access to information. The government should also publish its official information, including its directions for social and economic activities, on social media in addition to such traditional forms as print and electronic media, radio, and television. “We all know that social media such as Facebook can be accessed easily through mobile phones. Tens of millions of people are using the Internet and social media, so we need to post the government’s official information on social networks,” the government leader said. According to the Prime Minister, the current situation is very different from the previous times, due to the development of information technology. Therefore, in many cases, it will be late if people wait for competent agencies to pass on information according to their traditional communication plans. Instead, only through a text message, local authorities can keep everybody informed of their policies, PM Dung said. He pointed out that in May 2014, when some demonstrations broke out in Binh Duong and Ha Tinh Provinces to oppose China’s illegal deployment of its oil rig to Vietnamese waters, a mobile phone operator sent to all its subscribers a governmental message calling on people not to take part in riots incited by saboteurs. The Government Office should accelerate the application of information technology in the government’s operations to save time and costs, he recommended. The office should also make sure the central government can organize online meetings with grassroots authorities when fast responses are needed, the Prime Minister said, citing a mass evacuation in case of a natural disaster as an example.